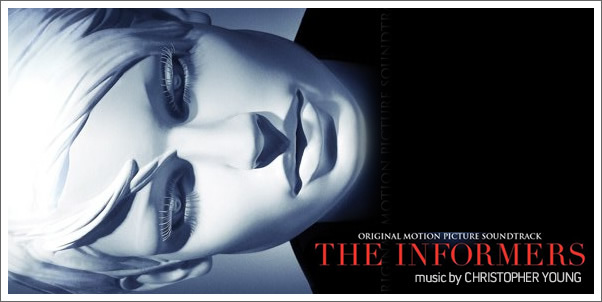 (June 1, 2009- Los Angeles, CA) – Lakeshore Records will release the original score for THE INFORMERS, available digitally (iTunes and Amazon Digital) and in stores on June 9, 2009. Christopher Young (The Uninvited, Untraceable) composed the music. The label released the original soundtrack on April 28th. Golden Globe-nominated composer Christopher Young has scored almost 100 successful features ranging across virtually every genre, all with strikingly original music. Never repeating himself, Young’s works extend from the spine-tingling Hellraiser showcasing his seminal upbringing in horror; to the new-techno sound of Swordfish and the resonant, genuine Celtic sounds of The Shipping News. With each successive Christopher Young crafted score, the composer continually stretches the bounds of his versatility. Young has worked with some of the top filmmakers of the past ten years including Norman Jewison (The Hurricane and Bandits), Sam Raimi (The Gift, Spiderman 3, The Grudge and The Grudge 2) and Curtis Hanson (Lucky You, Wonder Boys). In addition to his busy film-composing schedule, Young is imparting his experience and knowledge to a new generation of film composers, teaching at USC since the early nineties. He is a two-term past president of The Film Music Society and the president of the Madrid Film Music Festival in Spain. In such works as Less Than Zero and American Psycho Brett Easton Ellis brilliantly dissects contemporary American society, a culture in which too much is never enough. Now, adapting his own...In such works as Less Than Zero and American Psycho Brett Easton Ellis brilliantly dissects contemporary American society, a culture in which too much is never enough. Now, adapting his own acclaimed novel for the screen, he returns to the Los Angeles of the early 1980's with a multi-strand narrative that deftly balances a vast array of characters who represent both the top of the heap (a Hollywood dream merchant, a dissolute rock star, an aging newscaster) and the bottom (a voyeuristic doorman, an amoral ex-con). Connecting all his intertwining strands are the quintessential Ellis protagonists -- a group of beautiful, blonde young men and women who sleep all day and party all night, doing drugs -- and one another -- with abandon, never realizing that they are dancing on the edge of a volcano. Filmed with uncommon glamour and grit by acclaimed Australian director Gregor Jordan (Ned Kelly, Buffalo Soldiers), The Informers is an alternately blistering and chilling portrait of hedonism run amuck The film stars Billy Bob Thornton, Kim Basinger, Mickey Rourke, Winona Ryder, Jon Foster and Amber Heard. Senator Entertainment presents THE INFORMERS released in select theaters on April 24, 2009. THE INFORMERS original score album on Lakeshore Records will be available via iTunes, Amazon Digital and in stores on June 9th, 2009. THE INFORMERS original soundtrack is available digitally and in stores now. You can also pre-order the THE INFORMERS on compact disc here.